So there is a tricky thing to lumber. I’m so used to it now I don’t even think about it now, I just know the differences. But recently I saw an article on USA Today about a company suing Home Depot because the 2×4 they sold them was not actually 2 inches by 4 inches. It was 1-1/2″ x 3-1/2″, so that’s normal, but some people don’t know that. From the USA Today article: Rather, the retailers say, those are “nominal” designations accepted in government-approved industry standards, which also specify actual minimum dimensions — 1½ inches by 3½ inches for a two-by-four, for example, and 3½ inches by 3½ inches for a four-by-four.“Anybody who’s in the trades or construction knows that,” said Tim Stich, a carpentry instructor at Milwaukee Area Technical College. 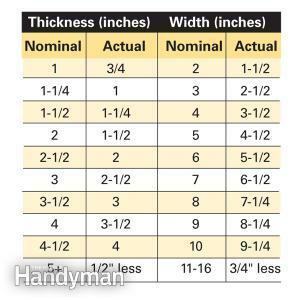 Also another tricky thing about common Dimensional Lumber sizes is that anything as big or bigger than a 2×8 will be in 1-1/2″ x 7-1/4″, so you’ll just have to remember that once you hit 2×8 dimensional lumber goes by 1/4,” see chart below. Dimensional lumber is a term used for lumber that is finished/planed and cut to standardized width and depth specified in inches. Examples of common sizes are 2×4 (also two-by-four and other variants, such as four-by-two in the UK, Australia, New Zealand), 2×6, and 4×4. The length of a board is usually specified separately from the width and depth. It is thus possible to find 2×4s that are four, eight, or twelve feet in length. In the United States and Canada the standard lengths of lumber are 6, 8, 10, 12, 14, 16, 18, 20, 22, and 24 feet. For wall framing, “stud,” or “precut” sizes are available, and commonly used. For an eight, nine, or ten foot ceiling height, studs are available in 92 5/8 inches, 104 5/8 inches, and 116 5/8 inches. The term “stud” is used inconsistently to specify length, though, so where the exact length matters, one must specify the length explicitly.